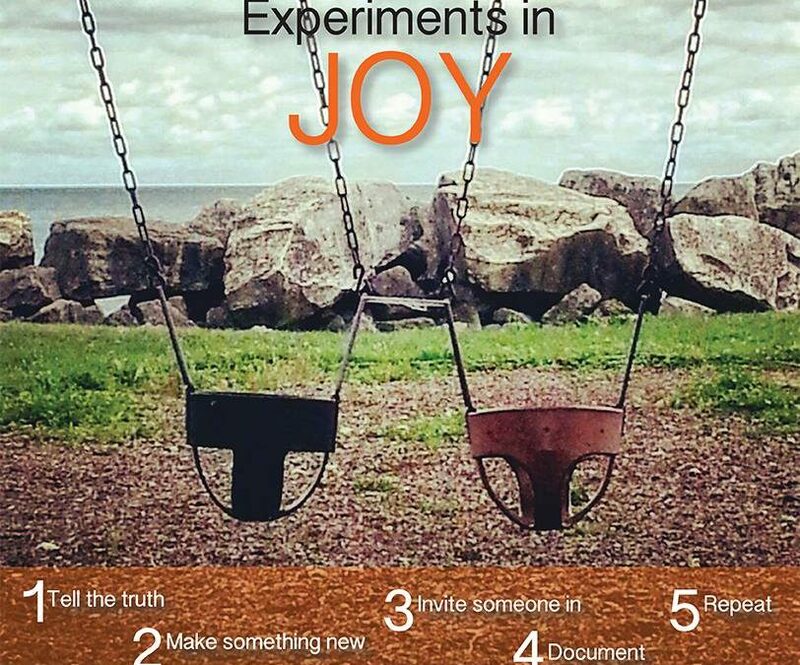 Giving myself the assignment to conduct experiments in joy this past spring was initially a way to shift my approach to following through on something I had signed up for on a more courageous and adventurous day. It was reunion weekend. I had to tell a story. And it had to be true. The guidelines: a time limit and a zing where my calculations had predicted a zang or an equivalent twist. The rest was up to me. I could do this, I reassured myself. I was a writer and performer, a woman of many voices. Delivering prepared remarks about a subject I knew well should not inspire dread. So, I would pick a story from my life—or, all things considered—cheat and invent one. If I was careful, I hazarded…. Really? I shook my head. What would be the point in that? This was not good. What in the wooly mammoth had I been thinking? Had things been going so well that I had forgotten who I was? So much of my accessible episodic memory was traumatic; I didn’t want to lead with that. And, the most recent past was tedious, thoroughly ordinary personal growth yadda yadda. What story could I tell? And What “I” would do the telling? Almost always the “I” in my poems or essays had been a consciously donned, construct, or an elected element of the author function, a persona that belonged to the ‘text,’ lived there in the text for the glory of the text–whatever that might entail. The last time I had addressed some assortment of this group of people endeavoring to tell the truth, I had taken the mic on the campus library lawn and spoken at some length about violated trust. It was a Speak Out Against Violence Against Women. There had been a hush, rapt attention and tears, and my body had gone numb as I stood back from it, a ripple of transcendental selves each looking at the others with curiosity and suspicion. This time I wanted to feel good and remain present–I wanted to hold firm—because it was my life to lose or gain and at this place I had begun writing and had begun to be restored. Returning, I was determined that the correlation between the speaker and my multiple selves would be as exact as I could make it. I reminded myself that the process of Experiments in Joy contained within it permission to fail. It had no precise method, no predetermined form: it might reveal itself to be a grinning baggy monster hopping to and fro or a monstrous bag from which we’d tumble in a heap, exhausted. Or it might manifest a muddy wave of giggles and guffaws. Or silence. And polite applause. It could be, by definition, an effort toward discovery, a quick jaunt to gladden the heart and delight body and mind. It need be neither perfect nor memorable. Even the worst of it could be sweat out at the gym and washed away with a shower (or downed with a shot of tequila). So I made a plan. Three versions of which I wrote and successively left behind in three places on the way to reunion. Multiple drafts of version 1) Chicago; 2) Brooklyn; and—just before showtime—3) my hotel. before the program began I hurried to scribble an outline and key points on the paper I did bring—a 2” x 3” a credit card receipt. What the hell. WTF. Wooly mammoth in a bog. Classic amnesiac. Sigh. Too late to back out. There were a few people before me in the lineup and they had their notes or full on pages, perfectly timed, everything was going swimmingly. Yep, yep. Remember to breathe. Drink some water. Just one more, then me. I stopped fidgeting to listen. I wasn’t ready. The speaker before me brought me to tears. I was splitting, there in the chapel, under water, in a dark corridor, between forearm and thrust. A teenager again. And in my early twenties. And younger. All in my feelings and judging: betrayal and hurt, confusion, self-blame, and accusation—trying to sort who I was from numb chest and my breath held in an awkward passing. I was next. I felt myself weeping. I went to the mic. The energy in the room had shifted. I steadied myself against the podium and looked out at the faces. At the woman I had just imagined myself to be. The violence and devastation of navigating a world you did not make, that was not made for you. I let go of the perfect idea of my “story,” its images and turns of phrase, its profundity, its perfect execution. Acknowledging my sadness, its weight—I stood firm in it and in my body. I held with me as I spoke, terror and despair, gratitude and compassion, resilience, her courage to spill still evolving self-confidence and ambition, a reaching worn down to a stark vulnerability. And owned my joy. I set aside the scrawled outline and began from awareness.